Today is National Picnic Day! I hope the weather where you are is less stormy than where we are. Go out and have a picnic! I have never been a huge fan of mayonassie. And having potato salad with tons of mayonnaise is never appealing. Plus, mayo goes bad in the sun. Here a mayo-free picnic-friendly potato salad that is simple and delicious. 1. Cut potatoes into large 1 inch cubes. Place in large pot and cover with cold water - about 1 to 2 inches above the level of the potatoes. 2. Meanwhile, cook bacon until crispy. Crumble or cut into little pieces. 3. Slice green onions thinly, using the white and the greens. 4. In a large bowl whisk together red wine vinegar, mustard, and salt and pepper. While still wisking, add in olive oil slowly. Add in green onions. 5. When potatoes are cooked, drain, and place in large bowl with dressing. Add bacon, stir until combined. Can be served warm or room temperature. Leave the skin on the potatoes. Taste and looks better. To cook bacon and avoid splatters and smelling like bacon for the rest of the day - make it in the oven. Place metal cooling rack on baking sheet. Place bacon on cooling rack and bake at 400 degrees for about 10-15 minutes, depending on thickness. yummy! I'll have to give it a try... even though I am a fan of mayo, I'm always up for a good potato salad. Thanks for sharing! Like Hil, I'm a big fan of mayo so I'd probably do an un-picnic-friendly potato salad and pack it in a cooler! But I do LOVE red potatoes in potato salad. Yum! I agree. Nothing more un-appealing than a mayo-laiden salad. ick! *Tears* Wish my family loved potato salad. I'll definetely try this recipe for myself though. Thanks for sharing!! I'm a potato lover. 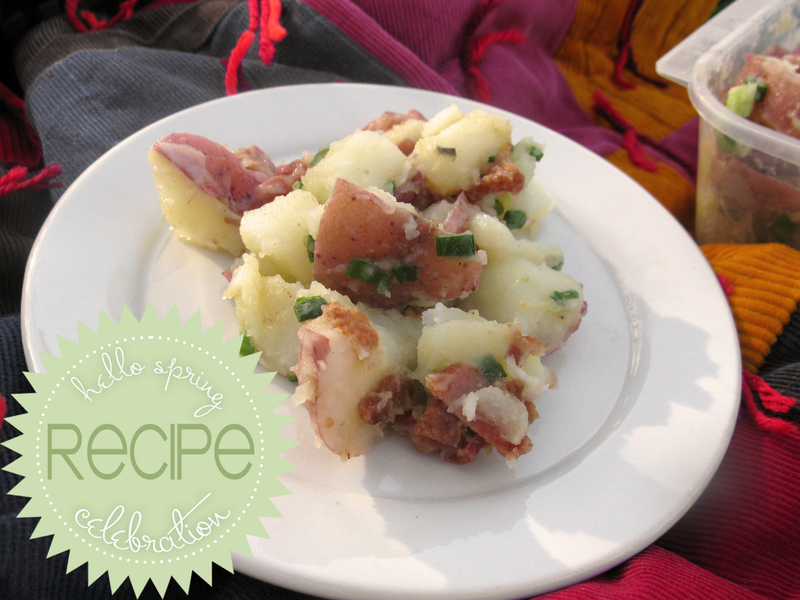 This one looks great - it's basically German potato salad. Adam and I ordered it when we were in Fredericksburg, Texas last month.